Christmas Day is fast approaching and you’re probably now getting excited to get your decorations up. While some families stick to a tradition such as decorating the home for the 12 days of Christmas, others like to get them up as early as possible. Whatever date you’ve decided to turn your home into a winter wonderland, there’s one very important thing you need to consider before you let your creative side loose – are your decorations toddler-proof? Not only do you risk expensive ornaments being broken if you don’t ensure they’re toddler-proof, but they can also lead to a risk of injury. 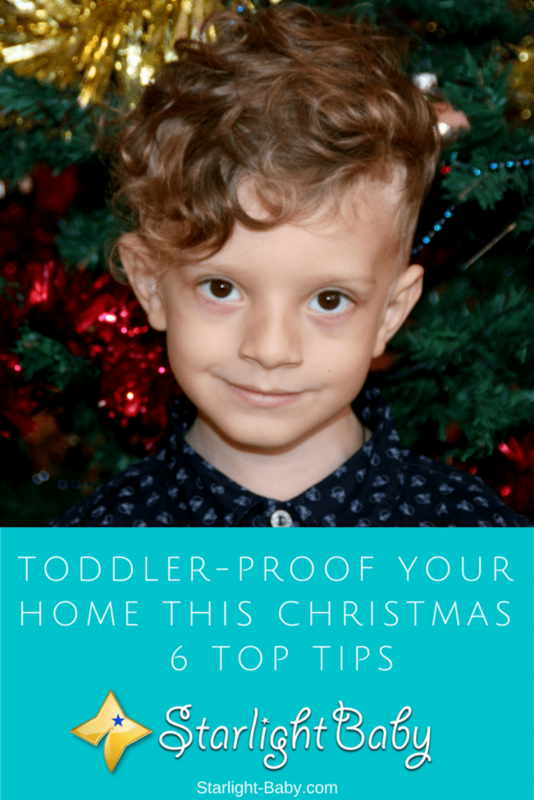 If you want to minimize the risks, here you’ll discover some of the best tips to toddler-proof your home this Christmas. Now keep in mind, these are general tips and there is no substitute for being vigilant. You can follow all the Christmas home-proofing tips you can find, but if you don’t keep an eye on your little one around the decorations, problems can still occur. Telling your toddler not to go near or touch the Christmas tree may work. However, each child is different and while some will more than happily obey your wishes, others will be a little more defiant. A great way to stop your little one reaching for the shiny objects on the tree is to put a barrier around it. A small fence is a great idea as not only is it effective, but it’s also going to look quite pretty. A white picket-style fence will look particularly magical and even add to the Christmas theme. It works particularly well if you place the tree in the corner of the room as the walls will act as a partial barrier, limiting the amount of work required. Creating a barrier around the tree doesn’t just stop your toddler from grabbing and potentially breaking the ornaments, it also prevents the risk of them pulling the tree over on top of them. Important – If you do choose to build a fence around the tree, it’s going to need to be big enough so your toddler doesn’t climb onto it. This would obviously increase the risk of injury, rather than decrease it! In fact, if your toddler is a climber, a fence may not be the best idea. An alternative option to keep the tree out of reach is to place it inside a playpen. If your tree is small enough, it can also be placed onto a table inside the playpen. Obviously, if you have a six foot tree this isn’t going to work, but if it’s two to four feet tall it should fit easily on top of a sturdy table. Playpens are designed to keep toddlers in or out so it makes sense they’d be a great place to keep the tree! Just be sure your toddler hasn’t yet worked out how to open safety gates and playpens! If creating a barrier isn’t an option, you might want to consider buying tree decorations which easily pull off without bringing the tree with them. A lot of accidents occur when toddlers grab baubles and other tree ornaments and they are tightly stuck on the branches. As they yank them, the tree comes with them and falls down. As an additional safety measure, you weigh the tree down at the base. This would prevent it from tipping over easily and eliminate the risk of it falling on top of your little one. You could even secure the tree to the wall for maximum peace of mind. Another great toddler-friendly tree decoration tip is to opt for ornaments that have ribbon ties rather than metal or wire ones. Ribbon isn’t going to injure your toddler if they do manage to get to them. It may not be traditional, but decorating the tree starting from halfway up rather than the bottom can also help. Your toddler will have more difficulty reaching the ornaments if they are located further up the tree. It may not look as nice, but at least you won’t worry as much about your toddler getting hold of them. Christmas lights require a power source and an extra plug can quickly gain your little one’s attention. So, if you’re using additional electrical sockets, make sure they’re covered up and kept out of reach. Similarly, any wires should be secured out of reach. You can pick up socket covers pretty cheap and the reassurance they provide is more than worth the extra money and effort required. Toddlers love Christmas decorations and they get especially excited when the tree goes up. Therefore, many parents have found a good way to minimize the chance of their little ones touching the tree is to threaten to take it down. You can test out this method by putting the tree up as early as possible. That way, if they do disobey your orders even after the threat of it being taken down, you can follow through with the threat. Then, you can try and put it up again in a few days. If they touch it again, take it down. They will quickly learn you mean what you say and the next time it goes up, they will be a lot more reluctant to touch it. These are just some of the great ways to toddler-proof your home this Christmas. Some parents are reluctant to put decorations up but then regret it later. Toddlers love the lights and look of the Christmas tree and it really does add to the festive spirit. As long as you take a few precautions, there’s no reason you and your family can’t enjoy a magical Christmas season with decorations, lights and all! The curiosity of toddlers is something not to be taken lightly because it makes them prone to accidents much often. Christmas trees are good for one thing and it’s being very flashy and light captivating. Toddlers don’t hold back when it’s lightning and shinny stuffs, they would do anything to grab such and take it. The tips of putting in a barrier around the Christmas tree is a great idea but there are kids who would mount the barriers and pass it, so the use grab and pull off decorations is best so that they don’t have the Christmas tree fall on them and cause injuries.